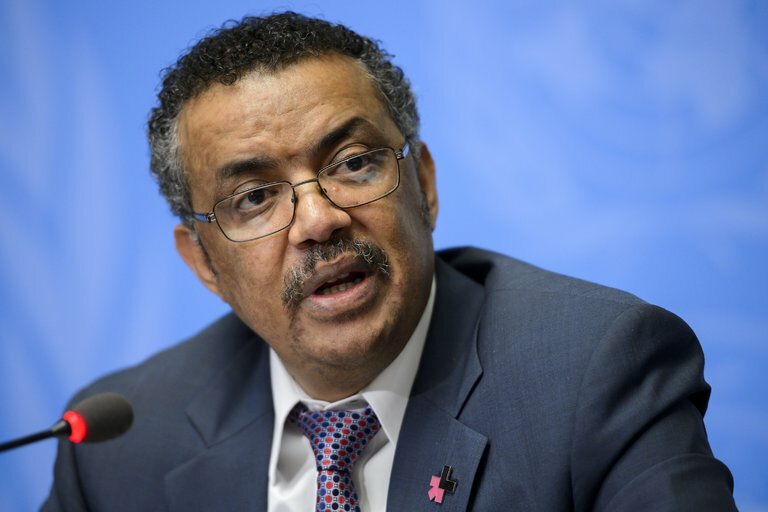 A leading candidate to head the World Health Organization was accused this week of covering up three cholera epidemics in his home country, Ethiopia, when he was health minister — a charge that could seriously undermine his campaign to run the agency. The accusation against Tedros Adhanom Ghebreyesus was made by a prominent global health expert who is also an informal adviser to Dr. David Nabarro, a rival candidate in the race for W.H.O. director general. The vote for the next director general of the W.H.O. is to take place at a weeklong meeting of the world’s health ministers in Geneva beginning May 22. Dr. Nabarro, reached by telephone on Saturday in China, said he knew of the accusations — especially because world health officials believe Ethiopia is suffering a cholera outbreak even now, while still denying it — but he insisted that he had not authorized their release. “I absolutely did not know,” he said. His adviser, Lawrence O. Gostin, the director of the O’Neill Institute for National and Global Health Law at Georgetown University, called attention to Ethiopia’s long history of denying cholera outbreaks even as aid agencies scramble to contain them. Some of those outbreaks occurred on Dr. Tedros’s watch. Mr. Gostin said he acted without consulting Dr. Nabarro, and did so because he believed the W.H.O. “might lose its legitimacy” if it is run by a representative of a country that itself covers up epidemics. In an interview, Dr. Tedros, who was Ethiopia’s health minister from 2005 to 2012 and remains highly regarded for his accomplishments then, denied covering up cholera. Outbreaks occurring in 2006, 2009 and 2011, he said, were only “acute watery diarrhea” in remote areas where laboratory testing “is difficult.” That is what the Ethiopian government said then and is saying now about an outbreak that began in January. W.H.O. officials have complained privately that Ethiopian officials are not telling the truth about these outbreaks. Testing for Vibrio cholerae bacteria, which cause cholera, is simple and takes less than two days. During earlier outbreaks, various news organizations, including The Guardian and The Washington Post, reported that unnamed Ethiopian officials were pressuring aid agencies to avoid using the word “cholera” and not to report the number of people affected. But cholera bacteria were found in stool samples smuggled out of the country. As soon as severe diarrhea began appearing in neighboring countries, the cause was identified as cholera. United Nations officials said more aid could have been delivered to Ethiopia had the truth been told. Somalia, which borders Ethiopia, is currently battling a large cholera outbreak, and a new vaccine is being deployed there. Aid officials believe cholera is also circulating in the neighboring regions of Ethiopia, but without confirmation, they cannot release the vaccine. Ethiopia’s health ministry is still calling it “acute watery diarrhea,” and told VOA News last month that it would not change that report without laboratory confirmation, which it said it did not have. Under the International Health Regulations, which apply to all W.H.O. members, countries must accurately report disease outbreaks. But the W.H.O. can officially report only what countries say. Historically, some countries have tried to cover up or play down outbreaks of human or animal diseases for fear that travel restrictions would be imposed, tourism would suffer or food exports would be curtailed — or simply as a matter of national pride. The regulations were strengthened after China denied for months in 2003 that it had a serious outbreak of lethal respiratory disease in its southern cities. That outbreak ultimately became known as SARS, for severe acute respiratory syndrome, and spread to several other countries, including Canada. Dr. Margaret Chan, the current W.H.O. director general, is from China, but was never accused of participating in China’s cover-up. She was the director of health in Hong Kong at the time and led effective responses to both avian flu and SARS. China has since changed its policy and now is often praised for acknowledging outbreaks promptly, fighting them aggressively and cooperating with other health agencies. There are many causes of acute watery diarrhea, and the treatment is basically the same as for cholera: prompt intravenous and oral rehydration, accompanied by an antibiotic if the cause is bacterial. But cholera is especially virulent and kills some victims in less than 24 hours. Since it emerged from the Ganges River Delta in 1817, it has killed tens of millions around the world. Outbreaks of cholera tend to wax and wane and are affected by many factors, including flooding, population displacement, the immunity of victims and a phage virus that attacks Vibrio bacteria. Dr. Tedros, who has the backing of the African Union and has been praised by international aid officials , and former President George W. Bush, is widely respected for his stint as Ethiopia’s health minister. He trained 40,000 female health workers, improved laboratories, created ambulance fleets and multiplied medical school graduates tenfold. Deaths from AIDS, tuberculosis and malaria, as well as deaths of young children and women in childbirth, fell by more than 50 percent. He was Ethiopia’s foreign minister from 2012 to 2016 and was praised for his diplomatic skills, then left office to run for the W.H.O. job. During Dr. Tedros’s campaign, he has been put on the defensive for working for a repressive government. Human Rights Watch and even the State Department have accused Ethiopia’s ruling party of displacing thousands of citizens, gunning down hundreds of protesters and jailing or torturing political opponents and journalists. He has answered that some human rights violations were serious mistakes, but argues that Ethiopia is a “nascent democracy” with the growing pains common to new governments. Dr. Nabarro is a British public health specialist who has led United Nations responses to Ebola, avian flu, hunger and other health crises. The third candidate for the top W.H.O. post is Dr. Sania Nishtar, a Pakistani cardiologist and an expert on noncommunicable diseases. Dr. Nabarro acknowledged occasionally getting advice from Mr. Gostin, but expressed surprise and some dismay that the issue had come up so late in the race. “I’m quite keen to be super careful to not pursue any activity that might be considered inappropriate,” Dr. Nabarro said. Dr. Tedros compared the accusation to James B. Comey, then the F.B.I. director, announcing a reopening of the investigation into Hillary Clinton’s private email server last year just before Election Day in the United States. The chicken coming home to roost! Woyane always thinks it is the smartest boy in the village, taunting the truth, resorting to all mechanisms including, threats, murder, maim, intimidation, and imprisonment. In particular it found the Westcan easily be duped as the West does boy understand how much it will go to cling to power in Ethiopia, and the cost it is willing to pay to do so. But eventually it will catch up. The West is not as foolish as Woyane thinks, and while it gives you the presumption of innocence, once it catches with your lies you are doomed and your resume’s credibility is put under question mark. Bill Gates the billionaire is one such Westerner, currently duped byWoyane lies and machinations. Once Bill gates realizes the scoundrels he is dealing with, he will shun them as Majority of Ethiopian has shunned this cabal of ethnic warlords. Hopefully Bill Gates will realize soon enough before he himself is branded as an accomplice of lies and subterfuges. The chicken coming home to roost! Woyane always thinks it is the smartest boy in the village, taunting the truth, resorting to all mechanisms including, threats, murder, maim, intimidation, and imprisonment. In particular it found the West can easily be duped as the West does not understand how much Woyane will go to cling to power in Ethiopia, and the cost it is willing to pay to do so. But eventually it will catch up on Woyane. The West is not as foolish as Woyane thinks, and while it gives you the presumption of innocence, once West catches you with your lies you are doomed and your credibility is put under question mark. Bill Gates the billionaire is one such Westerner, currently duped by Woyane lies and machinations. Once Bill gates realizes who the scoundrels are he is dealing with, he will shun them as the majority of Ethiopians has shunned this cabal of ethnic warlords. Hopefully Bill Gates will realize soon enough before he himself is branded as an accomplice of Woyane lies and subterfuges.